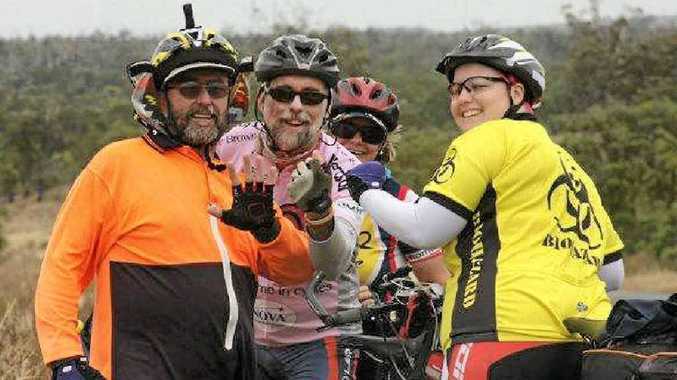 FROM Biloela to Sydney may seem like a long way to cycle but, with the memories of a good friend lost to cancer spurring them on, Di and Don Morris know they can achieve their Tour de Cure goal. The trip, which the pair are doing with good friends Gary and Naomi Latcham but separate from the official Tour de Cure, is far greater than any of their previous efforts for the cause. They will clock up a staggering 1400km. Mr Morris said he expected the foursome to do the trip in two weeks, meaning they would need to clock between 80-140km a day. Raising $95,000 over the past three years they have been involved in Tour de Cure, Mr Morris said he was raising the bar and aiming for more than $70,000 this year. "All of the money we raise goes to Tour de Cure," Mr Morris said. "The money goes to cancer research, cancer support groups and cancer education." And Mr Morris said he was prepared to put his body on the line in more ways then one. At one of the lead-up fundraising events Mr Morris will be part of the Peleton Bares all for Cancer show. "There will be a strip show with the full monty," he said. "We have young football players to 70-year-olds." Bookings are essential for the adults-only, sit-down event, which also includes dancing, drinks, nibbles, auctions, raffles and music trivia. Bookings are essential and tickets can be purchased through Mr Morris prior to the event. They will also be holding a golf charity day at the Biloela Golf Club. The ticket includes entry into the draw for a $100 holiday.